Jottings from Jennifer: Where is He Intersecting Your Lines With Others? 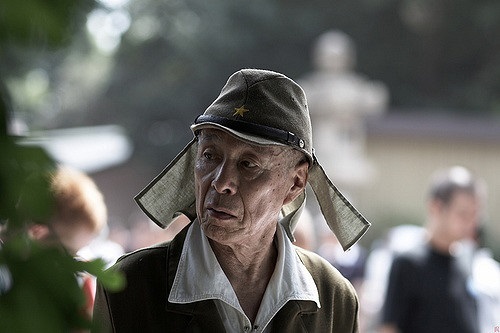 He's here again -- the Japanese Grandpa. I don't know him but I see him regularly at my library coffee shop. A black jacket hood pulled low covers half his face and hides his distinguished silver and charcoal hair today, but I can still see his thin grey mustache and beard. A narrow cheekbone rests on his right shoulder and his chest rises and falls in deep peaceful sleep. He has been curled up in a black leather arm chair beside a tall tropical banana tree since I arrived two hours ago. His six plastic grocery bags are lined neatly on the two corralled chairs beside him, and I find myself drawn to him. He intrigues me. I am curious about this dignified elderly man since I saw him deftly eating a breadstick with chopsticks at a round metal patio table last fall. Every few weeks I see him and we seem to share a similar Monday schedule. This is the second time I've seen him napping, though, and his restful vulnerability stirs respect, honor, and a slight protective feeling in me for him. Last time he had suddenly awoke, looked at his watch, and stood up. Trying several combinations of bags, he had adjusted their contents and transferred weight from one hand to another until he was satisfied. A young businessman and I had watched him that day on the edge of our chairs, both wanting to jump in with offers to help. I had hesitated, not sure if help would seem dishonoring. In the lull, the young entrepreneur had stepped in. "Excuse me, can I help you carry those somewhere?" he asked. The Japanese Grandpa had been surprised, raising his eyebrows to hear it again, clarified. After the second time, he had shook his head politely, graciously refusing aid. Grasping three bags in each hand, he stood, stowing a kindle-like device in a folded-up pocket in the fleece shirt under his jacket. Weaving sideways through crowded coffee tables, he had descended out of sight down the stairs. Was he a shop owner awaiting the bus? Was this a grocery run? Was he homeless? I wondered. I watch him sleeping here again now, and the questions cycle in my mind. I pray silent blessings on him and wonder about starting a conversation. God knows my Japanese Grandpa's name even if I don't yet, and he knows how many silver charcoal hairs are under his hood. My Creator is crazy about his gentleman and a sudden glimpse of God's love for this man chokes me. Who are the people weaving their storylines through yours? God knows their plots and he loves them fiercely. I'm reminding myself to slow down, to see them, and to step into their stories as possible, even if it's just silent prayer vigils for the strangers I pass on the street or see across the room from me. Where is God intersecting stories near you? We have been seeing new people at the church so I am slowly intersecting with them. for some of them, their church blew apart because of a domineering "pastor" who has made himself king. For others, they are searching for something. I look forward to getting to know them better. Jennifer ... thanks for the gentle reminder not to be so wrapped up in our own stuff that others' needs, their stories, pass us by. Yeah... I'm with you, Jennifer. There is no such thing as coincidence in this walk through the fallen. I appreciate and admonished to find beauty in all things and all people like you do so graciously. I look forward to the unfolding story behind the man traveling in your path. Thanks, Linda. I enjoyed your marriage post too. Hi Jennifer! What a lovely study on a man you have seen in your life. Sounds like he has touched the lives of others too at that coffee shop. He did that without a sound, no conversation. Just being. There was a man at a highway off-ramp who was always asking for money for his church. I gave for a while, but then decided to dial it back. I haven't seen him in a while now, and I wonder if he wandered off to a new corner, or just gave up. God greatly loved him too, and I wonder if his church survived? I don't know why this man made such an impression, maybe it was his tenacity. I could learn a lot from his example. Thanks for visiting my online home -- nice to meet you too! It's so interesting to people watch, isn't it, and imagine their storylines? And sometimes when we venture to reach out and connect with them and actually hear their stories, they're even more fascinating than we imagined! Looking forward to hearing more about your thoughts on your daily life! You know, I often wonder about the people I see, especially the elderly, when I am out. I wonder what their story is, if they know the Lord, and what they were like when they were younger, too. This often leads me to pray for them as well. I'm sure your "Grandpa" has an interesting story to tell. What a blessing that you have the opportunity to pray for him. I love reading about this Japanese Grandpa, and I wonder how your lives will continue to intersect! Do keep us posted. This is beautiful: "his restful vulnerability." I met a young homeless man almost 2 months ago, and I said at our parting that I hope our paths would cross again. And they have! At least three times since then. It's been amazing. God is so sweet to cross our paths with people over and again. Wow, I'm intrigued by him too. I want to know more. Thanks for the reminder to pray for others. We may not know them but God does and we can be certain He loves them. I live in a relatively small town and it's interesting to cross paths again and again with people whom I've never met. I like the way you humanized him. We can have a tendency to see people but not really "see" them. You know? As a society we are consumed with our own busyness and don't take the time to see and really wonder about the lives of those around us. I'm a naturally curious person, so when I'm out and have time to sit and people watch I always wonder what their story is. p.s. I'm reading When Kingdoms Clash by Cindy Trimm-a great book on praying powerful prayers. Just today, Jennifer, I read an article about homeless people finding libraries to be a sanctuary of sorts. Maybe you'll learn a little more about this gentleman as time goes along. Such a good word as you encourage us to really take note of those whose lives intersect ours. I need to be more aware. Blessings, friend!